"We really don’t know what else to say apart from that it does the job absolutely perfect." Well, where do we start? The Makita 1002BA is an outstanding piece of machinery and it surpassed our expectations beyond reasonable doubt. The 1002BA is a 4-3/8inch Curved Base Planer which currently values for roughly $350-$400 depending on the retailer. It’s aimed at planers who want to use it for both a personal and commercial use. What’s spectacular about the planer though, is that it’s made for a specific role. If you find yourself creating arches and arcs in timbers, then you won’t need to consider any other planer. It’s large two-handed design allows for a maximum control of cutter, providing unmatched levels of accuracy and performance. The large front grips allow you to maintain complete control over the machine. The specifications of the hand tool include a 4-3/8 inch Curved Base Planer. It has a sharpening holder, wrench, blade gauge, wing but, planer blade and operating manual. We tested the Makita 1002BA on a project we wanted to do, which was actually a custom wood bench. We chose monkey pod logs and slabs as our chosen material. What we noticed was tremendous and absolutely amazed us. It went through the normal board grain so easily that we honestly didn’t expect it. It also continued to power through the end grain cuts with steady pressure. The cuts were accurate and we managed to maintain complete control over the machine. In total, we made roughly 45 end grain cuts on a 15″x15″ piece and there was absolutely no sap wood to be seen. We really don’t know what else to say apart from that it does the job absolutely perfect. We built our bench and it looked amazing (if we say so ourselves). With an 11amp motor, you’re really going to struggle another wood planer that competes with this Makita on terms of raw power. It feels solid, which unfortunately means it’s quite heavy. But honestly, being heavy is the only negative thing we can find for this planer. The exhaust plane is large and ensures that it doesn’t clog. It does take quite some time to get used too, but most wood planers do. Take the plunge and get the Makita 1002BA if you need to create archers and arcs. You absolutely can’t go wrong with it. Expect unrivaled levels of performance and accuracy. So, where can you find the best price? We are always checking the internet for the best prices on this planer. And, as always, Amazon.com has the lowest price we can find. Because amazon usually has great prices on just about everything, they have a hard time keeping things in stock. 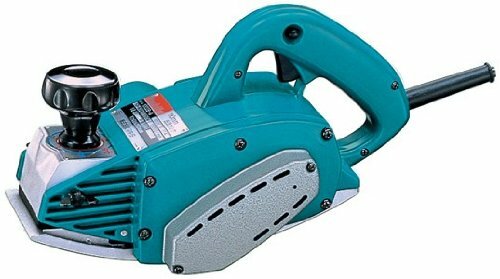 If you want to buy this planer, I suggest you head over to Amazon.com and buy one before they run out. Pros: Highly reliable and dependable hand planer that most contractors and woodworkers would love using. Cons: The Carbide blades are kind of expensive to continuously replace.